Six dogs were rescued from their locked cages where they nearly drowned in Hurricane Florence's fast-rising flood waters. Video of the heroic rescue was posted on Twitter by journalist Marcus DiPaola and shows the dogs barking and standing on their hind legs, desperate for someone to let them out of the cage. 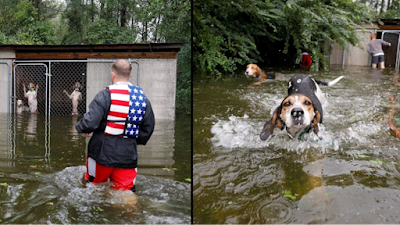 "Rescued six dogs in Leland, NC, after the owner LEFT THEM locked in an outdoor cage that filled with flood water that was rapidly rising," DiPaola wrote on Twitter. "We got them out, but by the time we left, the water was so high that they would have drowned. BRING YOUR PETS WITH YOU!" The video shows the dogs whimpering as volunteer rescuer, Ryan Nichols, of Longview, Texas, wades through the water to free them. As soon as he opens the cages, all the dogs swim out towards the volunteers. The dogs then scamper into a nearby wooded area followed by the rescue volunteers.